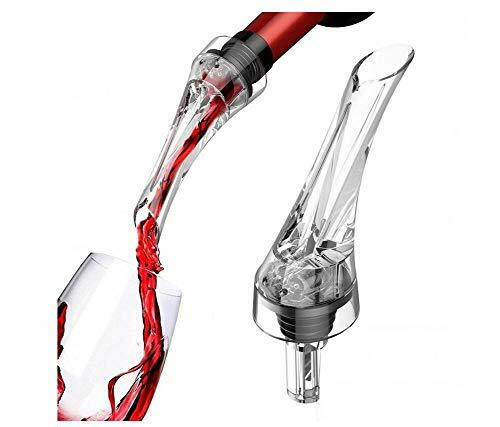 Premium Wine Aerator This wine aerator pourer is special designed for improving your wine taste, which gives you an amazing drinking experience. Excellent Wine Breather Your wine also needs air to make itself better. By using this wine decanter, the internal liquid pressure can be reduced with the external air. So its aroma, flavour will be much more better than before. Decanter Spout and Stopper It is wrapped with food-level silicone to improve the sealing performance of the bottle neck. Besides, it is easy to pour the wine right into the glasses. No waste. Nice Shape and Well Package The wine aerator pourer looks really nice and it is of great necessity for a dinner or party. It will worth your money. Easy to Use and Clean Just put one side into your wine bottle and than pour your wine. You don not have to waite.